final friday archive dive… | i made it so. as i mentioned before, these archive dives are coming to an end today. they’ve been a great way to get to know you all and to follow the common thread amongst us. a true pleasure for me to read your entries each week, and to often see others visiting from here. i hope you’ve enjoyed them. and while i reserve the right to pull a cher and bring these dives out of retirement one day… i think finishing up the year is a good time for change. speaking of change, it’s time i got out of my lovely swim trunks and cap don’t you think? so, for one last time, please share your links on the topic below. This entry was posted in friday archive dive and tagged change, final friday archive dive. Bookmark the permalink. Dear Ana ~ We are in Baltimore Maryland for a long weekend starting my birthday celebration :) but I did not want to miss your last Archive Dive. I have SO enjoyed them…thank you ever so much for putting the time and energy into making it happen week after week. thanks patty. i could do these dives forever and still not get caught up on all the posts you’ve done over the years :) thanks for always sharing. 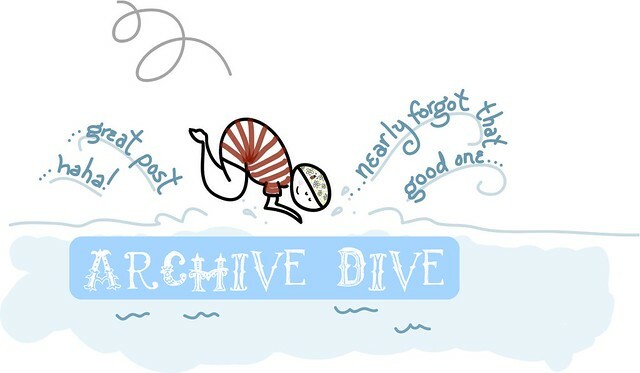 I have enjoyed Archive Dive so much but change is good. Thank you for hosting every week, looking forward to what is next. slice of life.. that’s so true eh? i liked it for that reason and will miss it for the same reason. as for the next series? you know i don’t like to commit to something unless i know i can do it wholeheartedly — but yes, i’ve been toying with an idea. i’ll think about it over the holidays and see how i feel in the new year. stay tuned. This series was so much fun Ana. I can’t wait to see what you come up with next. thanks for joining in ella :) have a great weekend too! ‘Twas a fun run, but change is good. And necessary. Looking forward to see what you evolve to next creatively!